Android P has a brand new app switcher that changes things up from the traditional vertical view to a more intuitive horizontal layout. While most Android users will have to wait until Android P comes to their device to get the new look, Samsung has made it available for Galaxy S7, S8, S9, and Note 8 owners now through its Good Lock app. To get the new app switcher, first make sure your device is running Android 8.0 Oreo. 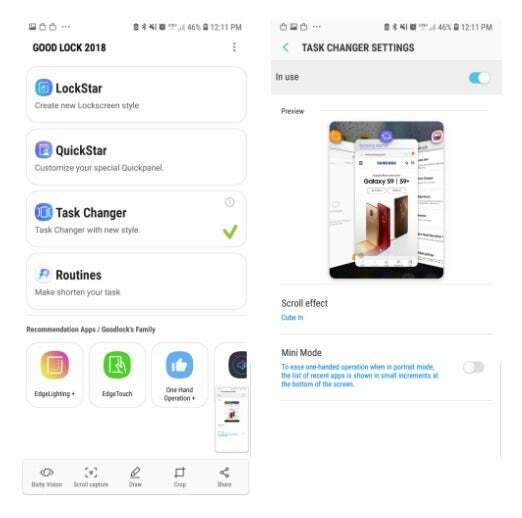 You'll then need to download the Good Lock app from the Galaxy Apps store (not to be confused with an app with the same name from the Google Play store). After that, pull up Good Lock and select "Task Changer" from the menu, which will require another installation (on-screen prompts will walk you through that). Once that's installed, head back to the original Good Lock menu. Select Task Changer (it should have a green checkmark beside it now), and you'll now see some customisation options. If you enjoy tweaking your device, the Good Lock app also lets you tweak your device in a number of other ways, including customising your phone's lock screen and picking the perfect colours for your device's quick settings menu. shame this is another US based story that doesn't work in Australia - good lock is not available yet in the Samsung AU app store. Check again I just installed this just fine on my Note 8.